Black and red with geometrical designs. Variety: Straight thread security line. 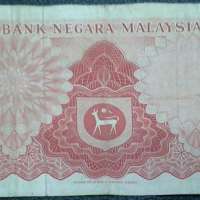 On 12 June 1967, the Malaysian dollar, issued by the new central bank, Bank Negara Malaysia, replaced the Malaya and British Borneo dollar at par. The Malay names ringgit and sen were officially adopted as the sole official names in August 1975. Previously they had been known officially as dollars and cents in English and ringgit and sen in Malay, and in some parts of the country this usage continues. The use of the dollar sign "$" (or "M$") was not replaced by "RM" (Ringgit Malaysia) until around March 1993. Showing portrait of the first Yang Di-Pertuan Agong, Tuanku Abdul Rahman ibni Almarhum Tuanku Muhammad of Negeri Sembilan. Old spellings which later perfected after a unified spelling system was introduced in 1972. GABENOR was affected and new spelling was GABENUR, but DBP later has it corrected back to GABENOR. It has been rumoured that this banknote exists in two different watermark varieties. One with Malayan tiger and the other with the portrait of the Yang Di-Pertuan Agong. It needs to be clarified that one with the portrait is a fake (modified) and it has never exist. 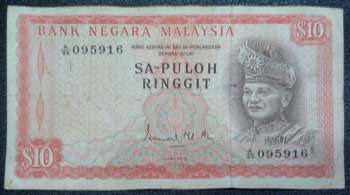 What the worth value for SA-Puloh Ringgit $10?